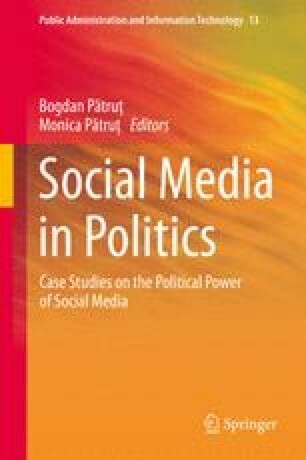 In this chapter, we show how we developed software for analyzing texts from political blogs. The software is based on solving some problems of graph theory. The premises of our analysis are: we have the corpus of a political blog, as empirical data; the posts on this blog convey economic, political, and socio-cultural values which constitute themselves as key words of the blog; there are interdependences among the key words of a political post; these interdependences can be studied by analyzing the co-occurrence of two key words in the text, within a well defined fragment; established links between values in a political speech have associated positive numbers indicating the “power” of those links; these “powers” are defined according to both the number of co-occurrences of values, and the internal logic of the discourse where they occur, for example in the same category of a blog, or in the same context. In this context, we intend to highlight the dominant values in a post, groups of values based on their links between them, the optimal order in which political values should be set for a more concise speech etc. Chen, H.-H., & Lin, C.-J. (2000). A multilingual news summarizer. In Proceedings of the 18th international conference on computational linguistics. http://nlg.csie.ntu.edu.tw/conference_papers/coling2000b.pdf. Accessed 24 Nov 2012. Pătruţ, B., Furdu, I. M., & Patrut, M. (2008). Bivalent verbs and their pragmatic particularities. In E. Kapetanios, V. Sugumaran, & M. Spiliopoulou (Eds. ), Proceedings of the 13th international conference on applications of natural language to information systems, NLDB 2008, London, UK, June 24–27. Lecture Notes in Computer Science (Vol. 5039, pp. 327–328), doi: 10.1007/978-3-540-69858-6_33. Tollis, I. G. (2012). Eulerian and Hamiltonian Path, HY-583 graph algorithms, University of Crete, http://www.csd.uoc.gr/~hy583/papers/ch14.pdf. Accessed 14 Nov 2012.